Don’t miss the premiere of Make: Live, the new streaming show and tell from MAKE. 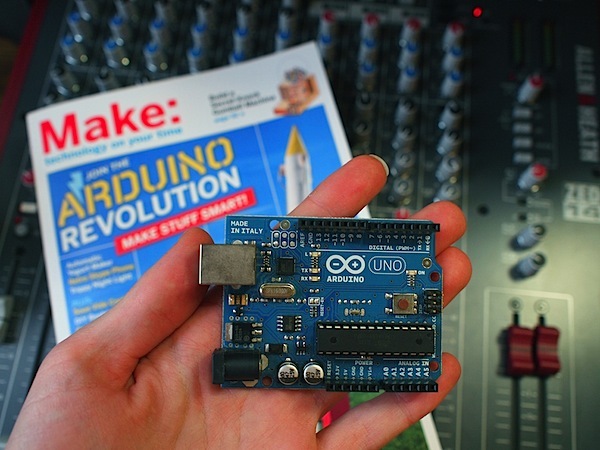 Join hosts Becky Stern and Matt Richardson as we explore the Arduino revolution in this inaugural episode. Guests Steve Hoefer and Collin Cunningham will show us their Arduino projects and take your questions. Please join us in the UStream chat or mark tweets with #makelive to interact live with the show. We’ll also be giving away a fabulous prize from Digi-Key to one chat member who can solve our photo challenge. We can’t wait to share some of the joy of making with you, live every other Wednesday, on Make: Live. We’re broadcasting in HD from New York City, and we’ll be archiving clips from each show to our MAKE YouTube channel and iTunes podcast. Freshly published in MAKE Volume 25, the Secret Knock Gumball Machine dispenses candies when you know the secret rhythm! Take a tour of the project as we examine it in-studio. Project maker Steve Hoefer will join us via Skype to take your questions. Make: Live is brought to you by Digi-Key.